dealt to us. We are adamant about bringing Peace to the table wherever we go, either on a personal level or group activity. for any group that seeks peaceful resolution and advances the cause of Peace and acceptability of groups traditionally marginalized. We hold a Memorial Service on Memorial Day at Christopher Columbus Park, by the water, where we honor those who have perished in war, to include civilians who’s lived were cut short. 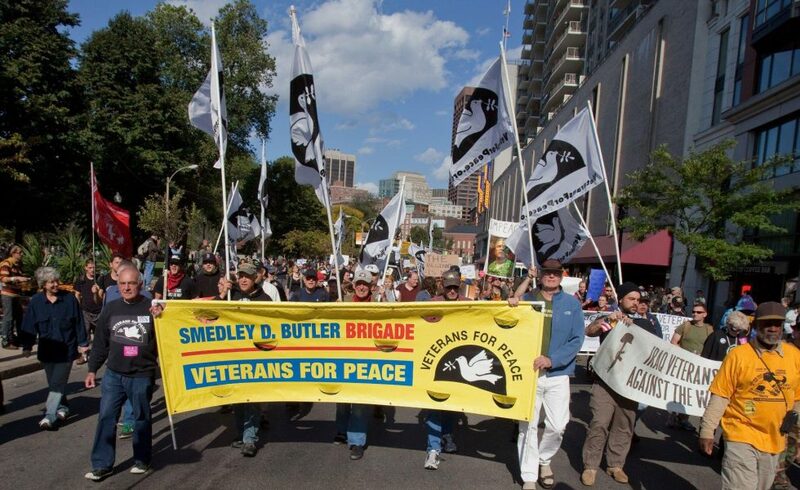 We also have a second parade on Armistice Day, (now called Veterans Day), and have a rally at Sam Adam’s Park by Fanueil Hall where we tel people that Peace is always better than war. We work with Iraqi and other immigrants to make their transition easier, and work with other Peace groups to get the message of Peace out to citizens. Our personnel come from various walks of life, but the bottom line is that we are Peace group that presses home the messages of Peace to all who will listen. In the future, we hope that all Peace groups will coalesce into a massive coalition that cannot be stopped. One of our goals is to educate people to the horrors or war through personal experiences and commitment to the destruction of the weapons of war, in particular, nuclear weapons. The proliferation of these weapons is a distinct threat to the safety of millions and must be stopped.